" by a hand that is seen on other inscribed Liverpool pieces. This painted inscription is enclosed within an elaborate printed cartouche of scrolls and flowers, with two birds, probably intended as livers, at the top left and right of the cartouche and, below these, scenes of shipping and a castle. (See the images below.) There is a printed cell border at the rim with, on the spout, small prints liver birds and a rose. This shows the right hand side of the cartouche and a Rampant Lion print. 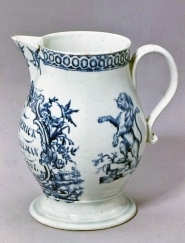 This print is seen on a few other jugs and mugs by John Pennington. This shows the left hand side of the cartouche and a Rampant Lion print. 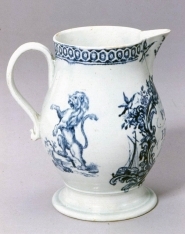 This Liverpool porcelain jug was made by John Pennington. It is inscribed "FREDERICK HEINZELMAN LIVERPOOL 1779" by a hand that is seen on other inscribed Liverpool pieces. This painted inscription is enclosed within an elaborate printed cartouche of scrolls and flowers, with two birds, probably intended as livers, at the top left and right of the cartouche and, below these, scenes of shipping and a castle. (See the images below.) There is a printed cell border at the rim with, on the spout, small prints liver birds and a rose.